Rejection is never a nice feeling, and it’s something you will inevitably face at some point in your career-hunt. Either you’ll send your application, but fail to get an interview; or you’ll get to the interview stage, but fail to get a job offer. We take a look at how to cope and move on from job rejection. Unfortunately, pre-interview rejections are one of the common realities of job seeking and can be attributed to the huge amount of competition that exists for work. You should not, however, simply blame these rejections on bad luck. If you have had very little response from your CVs and cover letters, something is going wrong with your applications, and it is important to work out what that is. 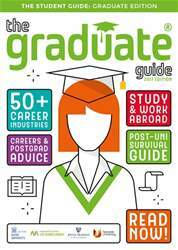 The Graduate Guide 2017 has everything you will need for life after university. It covers 50+ career industries and looks at some top destinations overseas. Or if postgraduate study beckons, you’ll find loads of information to help you decide which route to take — in the UK or abroad. Whatever the next step is for you, The Graduate Guide is packed full of information and advice to help you on your way. WHAT’S GOING ON IN THE JOB MARKET?